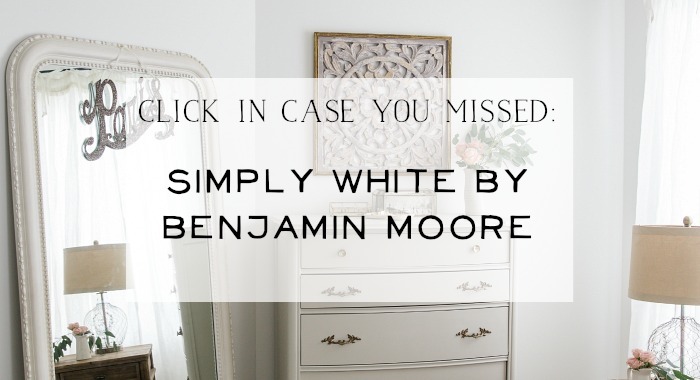 Here are some tips on how to pick white and grey paint colors for you home. 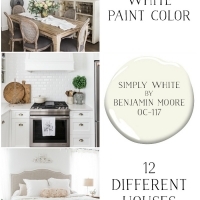 Picking paint colors for your house is hard but picking whites and greys colors are even harder! Whites and greys are so difficult to pick because they look so different in different lighting. The lighting is so different in every room. I researched grey and white paint colors on Pinterest first then went to the paint store to get samples. 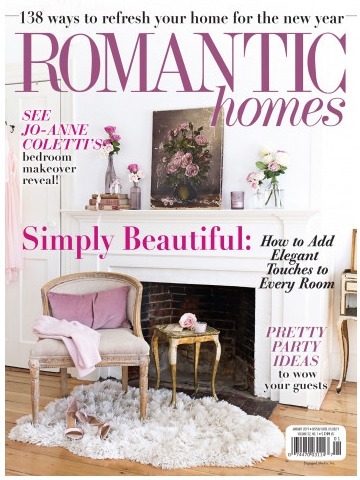 You can get so many great images on Pinterest on what each color looks like in different houses. 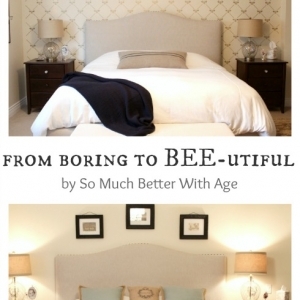 It’s important to know how each paint color looks in a room by painting it on the wall. I tried all the colors I picked in one spot in the kitchen. It’s important to paint on at least two coats to get the full effect. Greys can have odd undertones so it’s really important to put it on your wall. 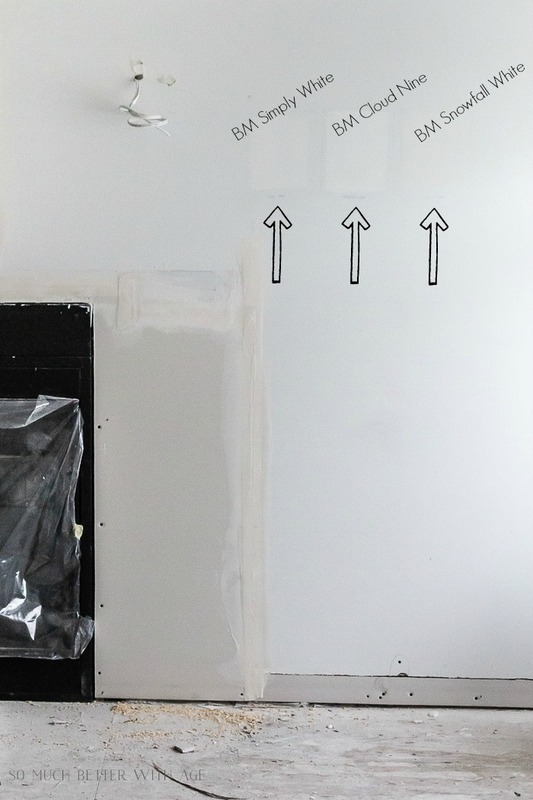 If you can’t paint it directly on a wall, paint it on white poster or foam board then go around to each room to see what the colors look like in each room. 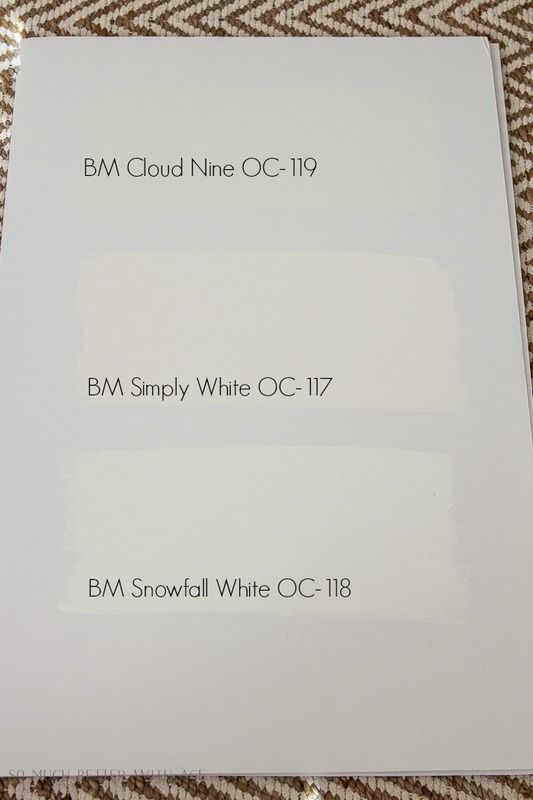 I painted Benjamin Moore Cloud Nine OC-119, Simply White OC-117 and Snowfall White OC-118 on form board and tested the color out in each room. So where is the grey going? 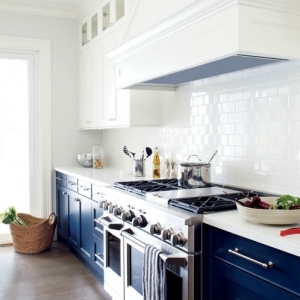 I love an all white kitchen but with so much white going on I wanted the island to stand out a bit. 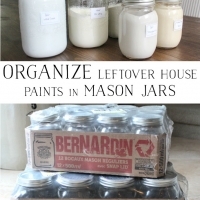 When I put Revere Pewter on the wall I knew it was too beige so I didn’t paint it on the poster board. 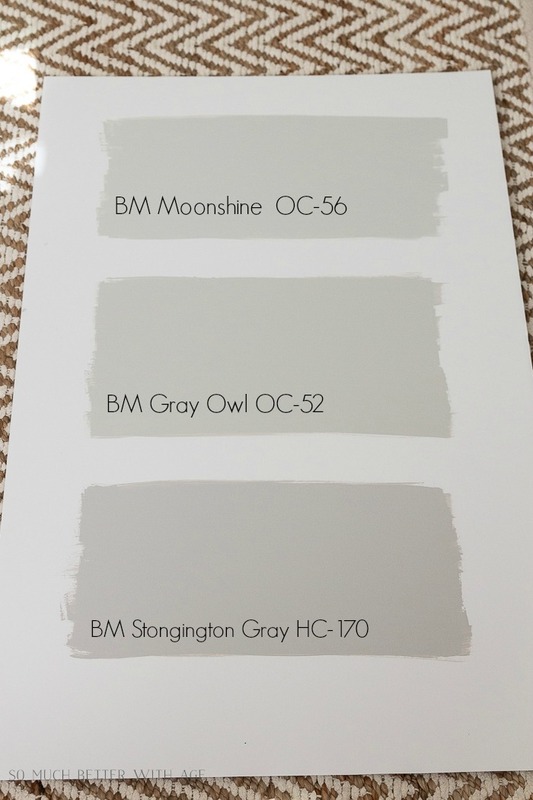 The greys I tried were Benjamin Moore Moonshine OC-56, Gray Owl OC-52 and Stonington Gray HC-170. I have a countertop sample so I made sure to put it next to the white and grey poster boards as well. I also painted the whites in the living room. It’s hard to tell in this photo but they looked totally different in this room than the kitchen. 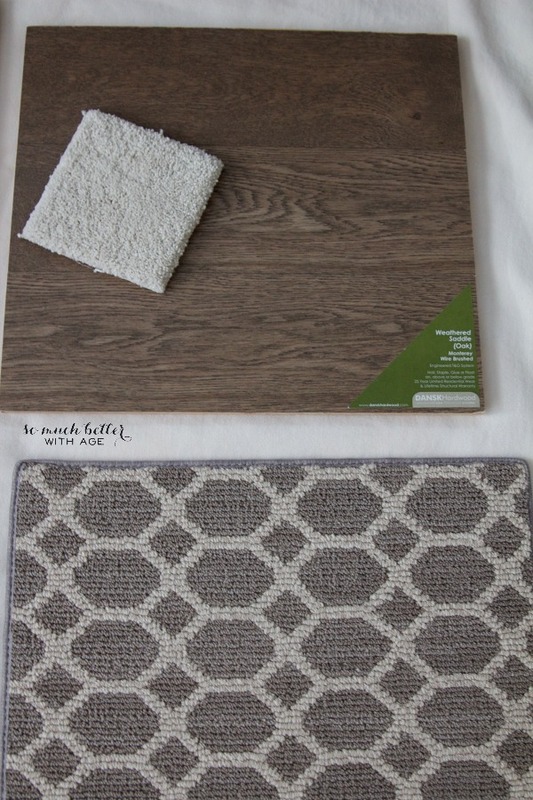 Simply White for the walls and trim and Gray Owl for the kitchen island. It’s going to look gorgeous. 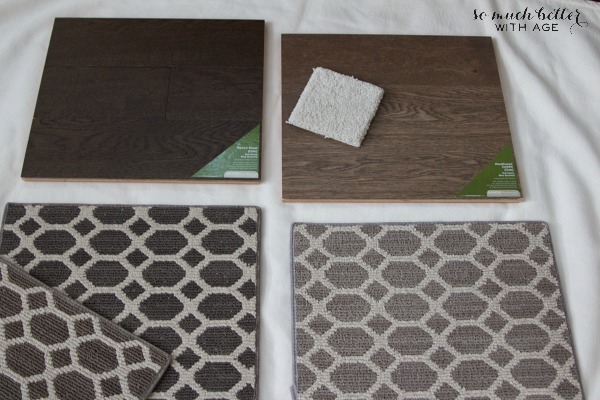 I’ve also made a decision on flooring. I wanted a rustic feel for my flooring but something not shiny and hid dirt well. Between the darker and the lighter, I picked the lighter. 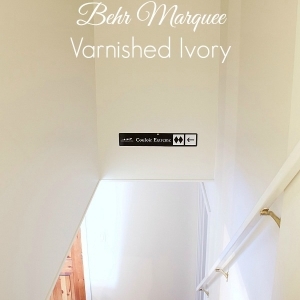 The cream carpet is going in the bedrooms and the patterned carpet I’m putting on the staircase like a runner. 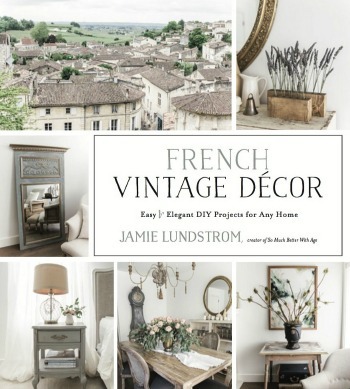 Remember the French chandelier I was picking for my dining room? I’ve also had this beaded chandelier forever and I’m having it hung in the little vaulted ceiling part of my living room. 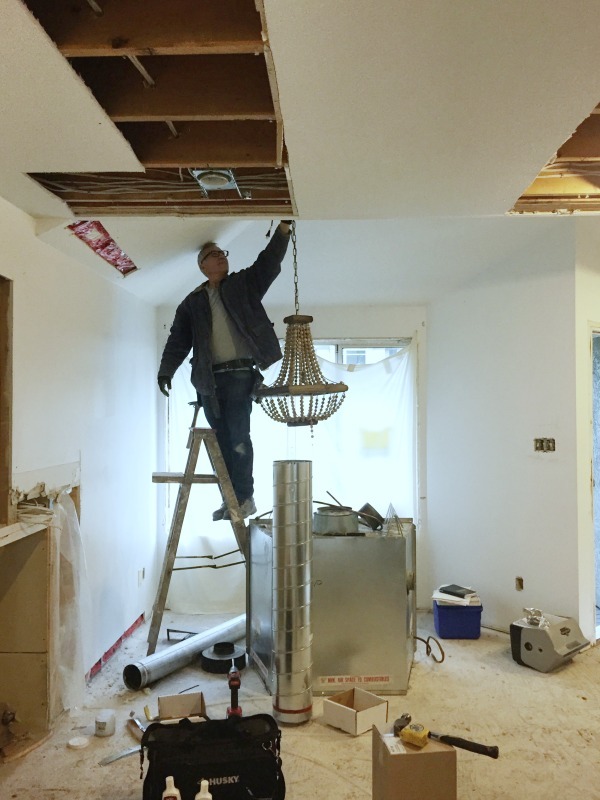 My hardworking contractor Dan is holding it up for me. It was quite the challenge getting electrical to that spot in the ceiling and hanging it centre of the window but he did the first time. It’s going to go perfect in that little seating area. Next week the drywall will be getting finished and painting will start. 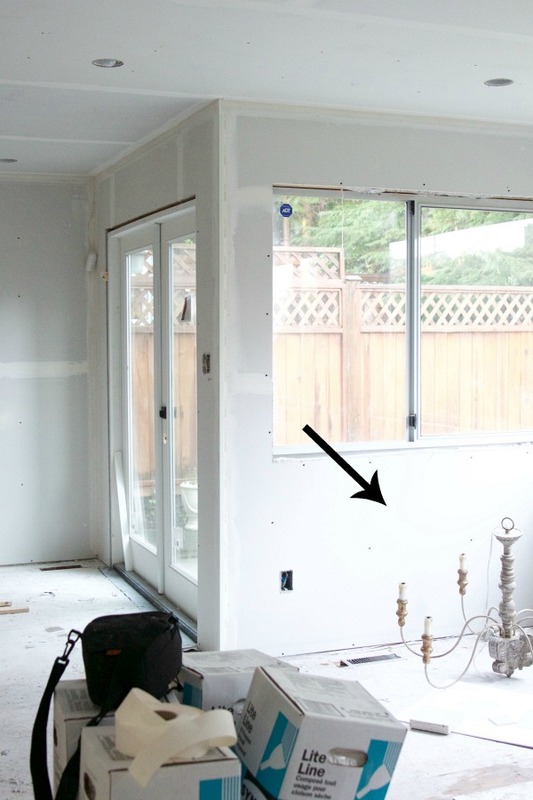 Click here to read more about my renovations. 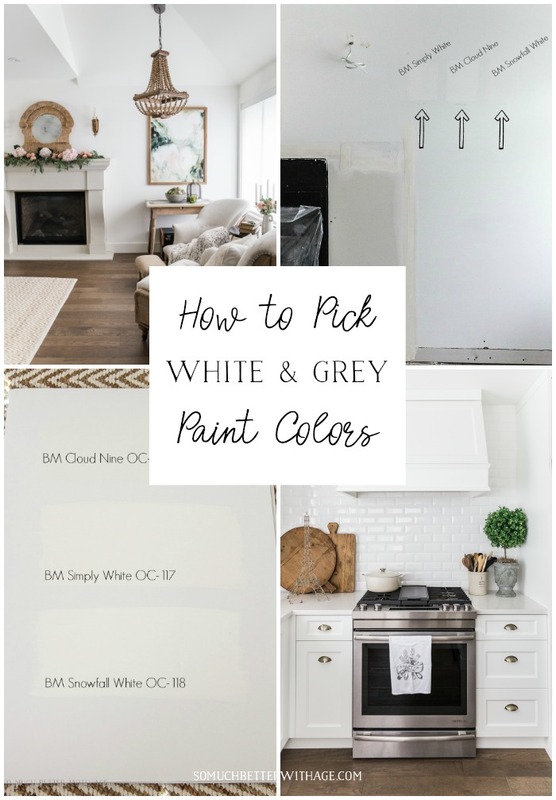 I hope this has helped you in figuring out how to pick grey and white paint colors for your home. hey girl love your choices! Can’t wait to see the reveal! YAY It’s going to look so pretty! Have fun girl! Love the choices you made. Can’t wait to see it all finished. 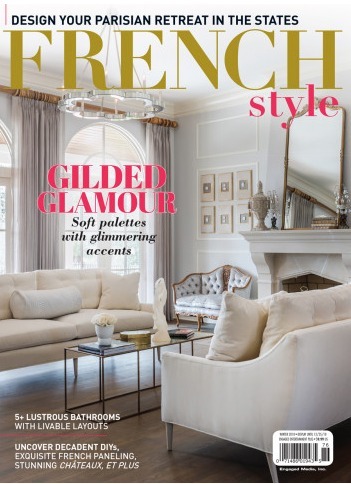 Really looking forward to seeing it all completed – great paint choices – and I love the Aidan chandelier! I am in the process of repainting using all grays and whites and it has been making me nuts! All the grays which are favorites, Revere Pewter, Gray Owl, Repose Gray etc. – turn green on my walls. It finally dawned on me that I need cool grays – which actually appear warm in my home. I found BM Thundercloud to be perfect. 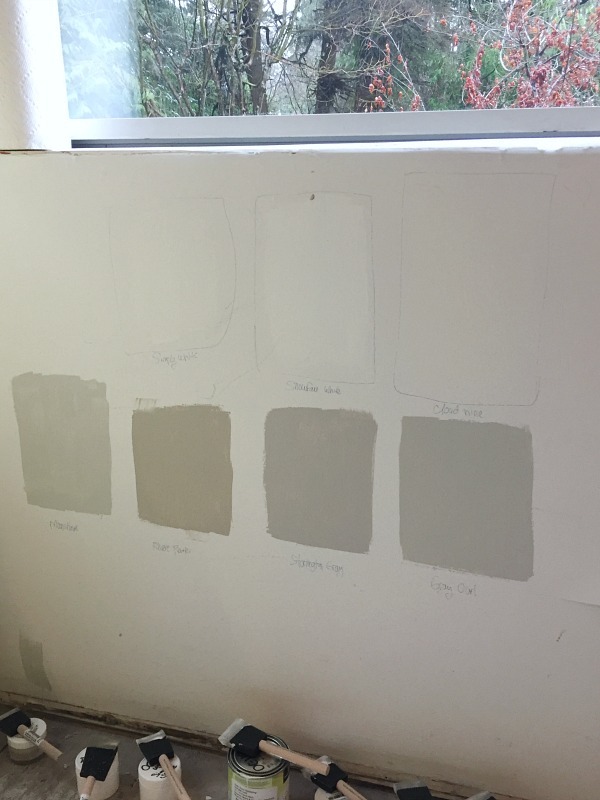 Now I am onto the whites – hopefully I won’t have to purchase 38 samples as I did with the grays! Greys are so hard, right? And they are different in different homes. I’m really loving Simply White. Good luck with the search! 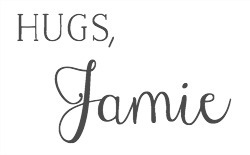 Love the post Jamie. The colour choices are awesome and it’s going to look fabulous! Thanks the insight into picking colours. You realy do have to see the colour in the house! Love all your choices!! You are so talented! Can’t wait to see it. 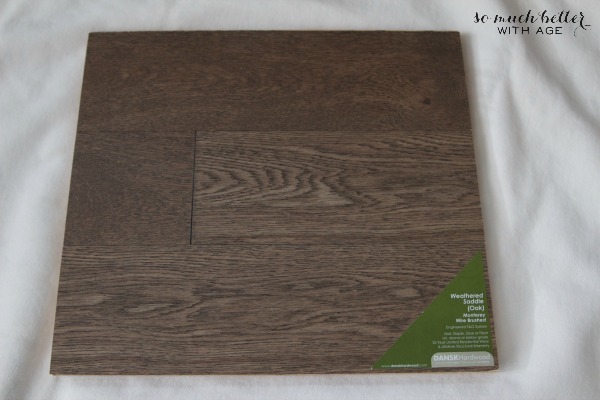 Can you do a post on how to pick hardwood flooring? My 17 year old hates when I paint samples all over the rooms to see which one will suit! But better that than repaint a bad choice. Thanks for sharing your process. Have a good day. Yes! It’s the only way, right?